Will PG & E Rates Go Up Because of the Bankruptcy? Click here - to read the full story. It’s a major collapse of a massive utility company, and a frightening concern for homeowners who rely on PG&E for their power - Actual Fire in Napa Valley. For homeowners, this likely means massive increases in their electricity rates. Utilities tend to pass on ALL costs to consumers 99% of the time and it’s really not fair. The last time this happened in 2001, homeowners saw $1300-1600 increases in annual energy costs, and have been paying those increases ever since … Are you ok with that? What would you do if your electric bill went up $50 to $100 a month because if their mistake? Now you can fight back going solar on your home or business. Do you think your rates won’t be affected by this tragedy? SDG&E already has a line item reflecting the FIRE increases. Get ready, this will effect everyone - You can’t run from this! How Can You Avoid Being Hurt By PG&E's Rate Increase? If you’re a PG&E customer, then rate increases are coming. This is unavoidable sorry to say. It’s futile to fight against PG&E when it comes to increasing their rates. 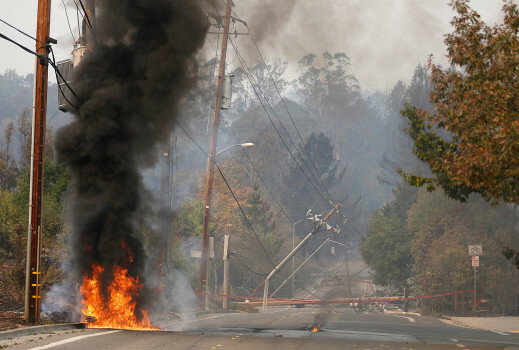 Utilities companies like PG&E have that baked into their business model. Generally, utilities have worked in the past to serve customers, but customers always bear the costs of unforeseen circumstances. … and, of course, financial loss, like bankruptcy. So ask yourself, what is t he best solution is to switch from PG&E to solar power? Whu Choose Us Over The Other Guys? RATE PROTECTION – Full protection guarantee from future electricity increases for the next 40 years! ENERGY DISCOUNTS – Receive rate reductions with QHIINC’s Neighborhood Awareness Program. EASY PROCESS – From sales to install, QHIINC support team takes care of it all. We’ve been helping California customers reduce their monthly payments since 1993, even before the wildfires in California became a headline. Best Financing Options Available - Period! PACE FINANCING - No money out of pocket, put the cost of solar on your property taxes. UNSECURED FINANCING - OAC, we can place the cost of your solar system on a credit card type loan. REFINANCE - We can do a complete refinance of your current loan and put the cost of the solar system in your new loan. REVERSE MORTGAGE - Are you 62 years old? … Put the cost of your solar or home improvements in one loan and let the bank give you a monthly income at the same time. CASH IS KING - For those who pay cash, get an immediate 10% discount on their solar electric system - USE OFFER CODE “QHI CASH”. CREDIT CARDS - We accept ALL major credit cards, … Need to get some miles for next vacation? Costco Members - AAA Members - Senior Citizens - Our Veterans - SAVE $1000 on your solar system while supplies last! * This offer cannot be combined with other discounts QHIINC offers. A Quality Home Improvement, Inc. home improvement specialist will be reaching out soon.